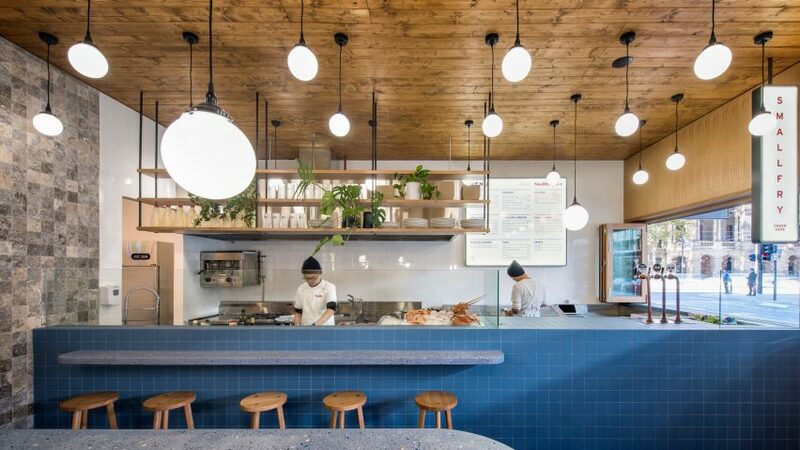 Sans-Arc Studio has used blue terrazzo, mottled grey travertine and stained wood to evoke a subtle seaside experience for diners at this Adelaide chip shop with a Japanese twist. The local studio, which specialises in shop and restaurant design, created the upmarket fish and chip shop to cater to nine-to-five office workers in the centre of the South Australian capital. The design of Smallfry Seafood draws on "nostalgic fish shop vibes" but uses contemporary materials, including ever-popular terrazzo, to update the aesthetic of the traditional chip shop. "The client knew that he wanted 'something different', something that would stand out against other venues in the area and unlike other typical seafood bars," said the studio. "Smallfry combines absolute rationality in its programme, with a unique and considered approach to materiality and the phenomenological experience," it added. "The finishes and form show sophisticated development of a concept that is rooted in the familiar Aussie fish and chip tradition, with a modern, refined reframing." The studio wanted to channel a "subliminal, less in-your-face oceanic influence" through the textures and colour of the materials used in the fit-out, which was carried out on a budget of A$150,000 (£92,000). The material selection also draws on the owner's heritage by referencing Japanese seafood markets, as well as the no-frills Swan Oyster Depot in San Francisco. The menu also takes cues from the proprietor's Japanese heritage, with sashimi and tempura offered alongside more traditional chip-shop fare. The 50-square-metre fish bar has a wooden facade that aims to contrast the "cold" concrete and steel shopfronts on Waymouth Street. A folding window permits passers-by a view into the kitchen, while the dining area is given privacy by a low-level curtain. A blue-tiled bar splits the modest space in two, acting as a serving area, till-point and informal dining area. A hanging shelf hosting plates and pot plants further separates the dining and cooking areas. A narrow terrazzo plinth with rounded edges projects from the bar in front of an iced counter used to display the day's catch. Further terrazzo tables project from the walls of the dining area, dividing up an upholstered bench that provides a spot for a quick bite, while a longer table with wooden stools extends in front of the bar. The walls and floors are covered in travertine stone flags, while the niche the upholstered bench is set within and the ceiling are lined in planks of wood. Globular pendant lights on long black flexes hang from the ceiling of both the kitchen and dining areas. In contrast to the "ocean palette" the studio set out to create within the dining space, the kitchen has a much more pared-back and clean aesthetic created with white tiles and metal fixtures. "The materiality considers the tactility and experiential qualities of the ocean, whether eating a casual dinner by the beach, or swimming underwater amongst phospherants," said the studio. "Colour and texture reference these moments and experiences of the ocean, creating a strong, yet almost intangible link to another place." Just one block over, on Leigh Street, Sans-Arc Studio designed a cabin-inspired bar and kitchen. Squeezed between two much taller buildings, the single-storey pitched-roof restaurant is clad and lined in timber to create a cozy atmosphere for diners and drinkers. Photography is by David Sievers.